Show Racism the Red Card - Anti-Homophobia education pack: Now in Stock! 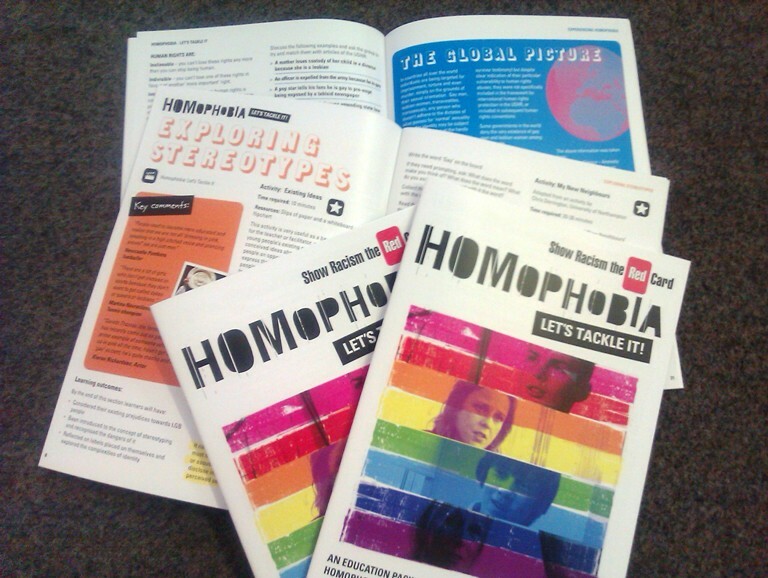 Anti-Homophobia education pack: Now in Stock! Show Racism the Red Card has been awarded additional funding from the Northern Rock Foundation to print the Education Pack which accompanies the Homophobia: Let's Tackle It film. "This is great news for SRtRC and we're really grateful to the Northern Rock Foundation for their support," said SRtRC Chief Executive, Ged Grebby. "At present the Education pack is available in a PDF format on the DVD itself. To have printed copies will be a real boost to teaching about this important issue and show what we believe is a fantastic resource to as wide an audience as possible." Northern Rock Foundation were the major funder behind the development of the 'Homophobia: Let's Tackle It' and 'Talking About Homophobia' films which feature on this resource. This new funding has allowed 2000 copies of the accompanying education pack to be printed.